Rare Collectors... Start Your Engine! If you were with us back in April, you saw the introduction of Limited Quantity sets. Some people love them, some people (the ones who forget to set their alarms) hate them, but they give those who like collecting rare gear a chance to grab a shining trophy that only a select few will possess! The Legion-only Evolved Paragon armor set will be available in-game for Legion Tokens. Each set also comes with a unique badge in your Book of Lore! The Chaos LQS opens at 12:30 PM this Friday, July 4th! (That is early afternoon, server time, not in the middle of the night.) Not sure when that is in your part of the world? Here's a timezone converter to make setting your alarm easier! How Do Limited Quantity Sets Work? Note: Item quantities will restock throughout the weekend so that everyone gets a fair chance at the gear. Will there be enough items for everyone? No, but with multiple restocks your changes of getting an item are pretty good... as long as you keep an eye on your clock and don't miss the restock! Will item quantities update automatically? 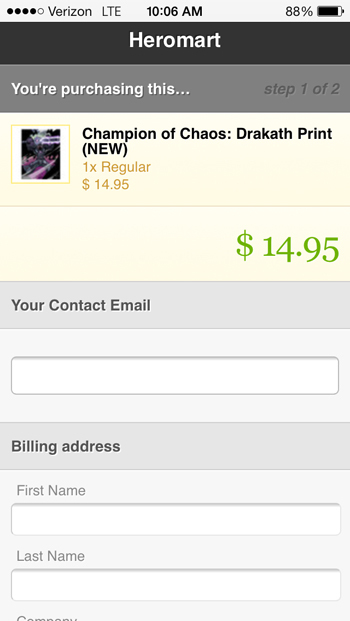 No, but once you purchase an item from the shop or revisit the page, you'll see an updated amount. If a set doesn't sell out right away, will the restock amount roll over? Yes. The next restock amount will always be added to the previous amount of gear. Gear not sold before a restock will remain in the shop. Will the items be 0 ACs? 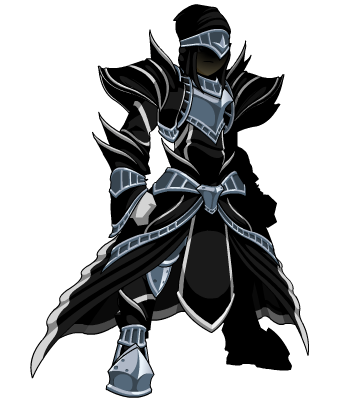 All items sold in the LQSets will be 0 ACs, so you can keep them in your bank for free, forever! Do I have to be a Legend to buy the Legend-only sets? You do not need to have an active upgrade to purchase the Legend sets, as long as you have upgraded your account at any time in the past! Find examples of the web page's layout on our Limited Quantity Set FAQ page. After three weeks of intense war combat, the team and I wanted to switch things up a bit, give this latest war a different feel. But the feedback from many of you was that the new war meter was confusing, so we've reverted the displays back to the original system. NO war waves were lost in the conversion; we are now simply displaying the values in the old, easier-to-read way. As of this writing, the Alliance is holding strong with a 2% lead over Chaos (21% to 19%). If you are upgraded and support the Alliance, you can also complete the quests in /ChaosNorth to recruit Xan. Those quests also raise the Alliance war meter! Have a great Saturday, and enjoy the rest of the battles! Don't miss this week's latest additions to the war merge shop, and make sure to check out the gear in the Summer Shop (find it in your game menu)! The next batch of Aranx's summer gear will arrive on Monday, so if you've been hungering for some new hair-style helms, you're in luck! Hot Gear to Help You Look Cool in Battle! There is almost nothing cooler than seeing a hail of FIERY FLAMING SPINNING SKULLS OF DEATH rain down on your opponents... so that's why we asked Hollow (lead of the original AdventureQuest) and AQW Artist Blade to break out their pyromancy skills and craft us all-new Xan-themed gear! THEN we turned that burning insanity even cooler (oh yeah, we made that pun) by adding it into the animated item special engine! Find the Flaming Death Skull (!!!) gear in the Chaos Rares shop from Maya in /worldwarlore! It's getting hot in here, so bring all the heroes... into game menu for the 2014 Summer Shop! 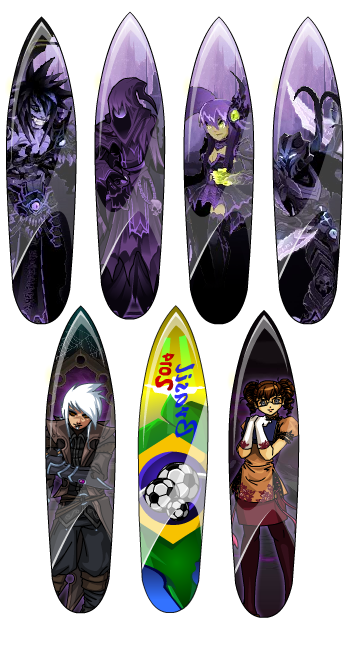 Once again, we've got a crazyawesome selection of Chaos, NPC, and World Cup-themed surfboards by Memet and EpicDuel guest artist, Bidoof! You'll also find a hole inventory's worth of the hottest beach-themed gear outside of Lolosia by the incomparable Aranx! Unlock the Forsaken Warlock gear when you upgrade or buy AdventureCoins! EVERY upgrade bought in June will unlock the Shadow Warlock set at the end of the month! Or get all 38 Wolfhound Warrior, Dragon Emperor, and Forsaken Warlock items with the Fantasy Hero Package! The Summer of Chaos Heats Up! Forces of Chaos, FALL IN! Alliance Army, /unsheath your weapons! The next battle is happening NOW, and once the heart of the Dragon's Lair is pierced and its secret revealed, there is NO going back! Alliance Army Goal: Empress Gravelyn commands you to slay the Chaos Legion to buy her time to rally more forces! /Join LairDefend to begin! 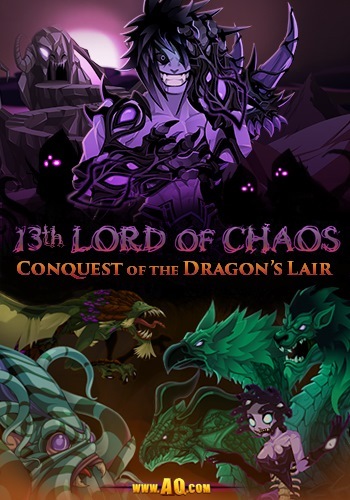 Forces of Chaos Goal: Destroy the Lair's Defenders to gain access to the heart of the Dragon's Lair, and unlock the secret of the 13th Lord of Chaos's destiny! /Join LairAttack to begin! The war meter you see is a visual representation of the shifting war waves, illustrating the Chaotic way the frontlines of both the Chaos and Alliance forces shift back and forth. Many of the events in the Summer of Chaos are NOT scripted; the war cutscenes were written for each different outcome (if the Alliance had won in Darkovia, Safiria and the 10 million vampires would not have died!)... but many events in this storyline MUST happen. Your Hero's destiny has been set since you first got struck by lightning and fell down the mountain; we have been leading up to this for years! That means to unlock the Gauntlet waiting for you... you MUST finish all of the Chaos Lord sagas and face Drakath on top of Mount DoomSkull! 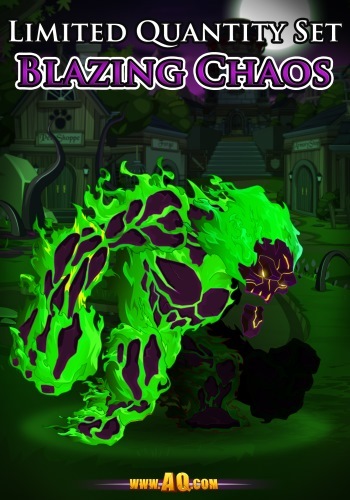 In order to take out even MORE of the Chaos Legion, Empress Gravelyn is sending Legendary Alliance members to locate Xan, one of Lore's most powerful - and insane - Pyromancers! If you are not caught up on his story, /join volcano to begin it! Talk to Warlic in the World War Lore map to begin this story! Some say the world will end in fire... some in ice! You'll need to save Xan from the legion of Chaos monsters sent by the 13th Chaos Lord AND overcome his paranoia to convince him that his best interests lie in helping YOU blast tens of thousands of Chaos Warriors to smithereens... or his fire will be quenched for good! 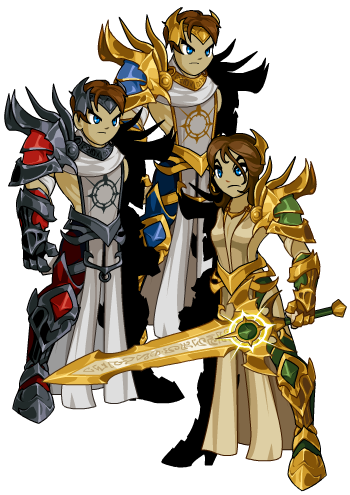 Talk to Loremaster Maya when you /join worldwarlore to see the newest gear in our Chaos War Rares and Chaos Merge shops! Earlier this week, we released the Stalagbite's Herald and Champion sets in the merge shop, and tonight you'll find some of the coolest (literally!) new weapons released yet! The 13th Chaos Lord senses a VERY powerful object kept deep inside the Dragon's Lair, and is sending the forces of Chaos to clear a path to it! 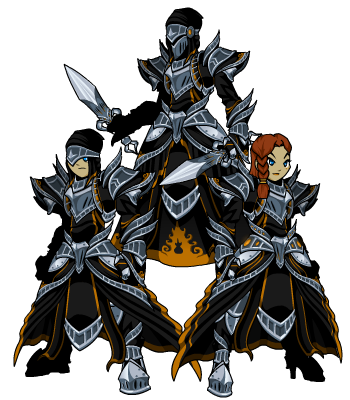 Empress Gravelyn needs the Alliance Army to defend the Dragon's Lair long enough to buy her time to gather an even greater legion of warriors to combat Chaos! Which side will YOU fight for? Battle your way up Mount Vasalkar to reach the heart of the Dragon's Lair! Once inside, the 13th Lord of Chaos will unlock one of Lore's most closely-guarded treasures... and YOU will be transported to a plane where you can re-battle the first 12 Chaos Beasts in the Chaos Beast Gauntlet! The POWER WILL BE YOURS! Empress Gravelyn is putting out a call to ALL Alliance members! Defend the Lair to buy her time! She needs to gather more forces before she launches an attack on Mount DoomSkull! 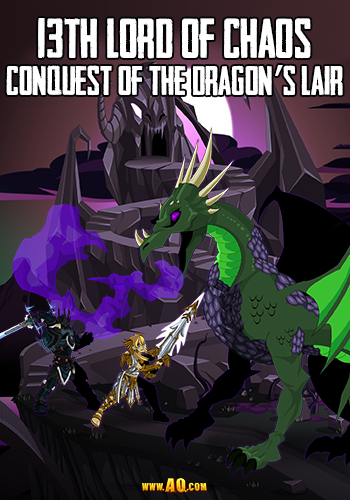 Battle your way up, destroying the forces of Chaos, to reach the heart of the Dragon's Lair! Alliance: Your Empress Needs You! Once inside, the 13th Lord of Chaos WILL unlock one of Lore's most closely-guarded treasures... but Empress Gravelyn will have gained the time she needs! YOU will be transported to a plane where you can re-battle the first 12 Chaos Beasts in the Chaos Beast Gauntlet! Unlock ALL 38 items from the Wolfhound Warrior, Dragon Emperor, and Forsaken Warlock sets and an exclusive character page badge when you get the Fantasy Hero Package! Read the Package Pass Design Notes for full details! The Wolfhound Warrior and Dragon Emperor upgrade packages are no longer available, so this is the only way to unlock this gear! We had an issue with our email system yesterday and earlier today. If you emailed us through our help pages at www.AQ.com/help via our email forms and received a delivery failure message, please email us again. If you emailed us and do not receive a reply after 3 business days, please email us again via our email forms through our help pages as we may not had received your email due to this issue. My Artix HelpTeam and I read and respond to all emails, we don't have any fancy robots helping us, so we want to make sure we did receive and respond to your email - we are not ignoring you! We do not use a ticketing system, all emails sent through our email forms are sent to us directly. Thank you so much and BATTLEON! Thank you for being a part of this once-in-a-lifetime event! Battled (or are in the middle of battling) up to the top of Mount DoomSkull to confront Drakath. Seen the lands you've loved attacked and burned to the ground by the forces of Chaos. Watched as an NPC (non-player character), Safiria the Vampire Queen, is slain because of the havoc Chaos wreaked in her lands. After six years of sagas, stories, live events, and holiday releases, we have reached the pinnacle of AQWorlds' first main storyline; World War Lore is a massive, world-shattering event, and it is happening RIGHT NOW! You are playing a vital part in it, and THAT is what makes AQWorlds so special - YOU being here as we build the events, telling us what you want to see, and helping us put those ideas in-game. And now... we are poised to discover the 13th Lord of Chaos' Chaos Beast. The creature that, once risen, will unlock the final rune on Drakath's Chaos Portal. Chaos has had the upper hand until now, but as our long-time players already know, anything can AND WILL happen… (even WE have not known everything that would happen this summer, because we needed to know what you wanted to see) and everything you've done so far is leading up to something truly amazing. We want to thank all of you who have supported us so far. Without you, we would not be here to make AQWorlds, and your fellow heroes would not be able to play this Saga or those to come. We are already in production for the next main storyline after the 13 Lords of Chaos Saga finale. AQWorlds is not going anywhere* and we hope to see you battling alongside us for years to come! If you enjoy these special events and our weekly releases, please support us by upgrading your account. We are going to make it worth your while this summer... and beyond! This Friday, join us as the forces of Chaos battle to unlock a VERY powerful object locked away inside the Dragon's Lair while the Alliance’s army fights to prevent the 13th Chaos Lord from breaching its defenses! 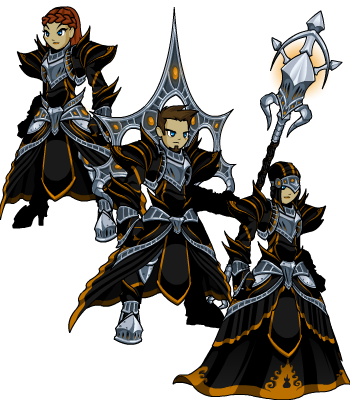 First look at the Dragon's Cleric gear for the Rares shop! Empress Gravelyn received word from the Mirror Realm that deep inside the heart of the Lair, one of our world's most powerful objects is being kept safe... because their realm is growing increasingly unstable! Alliance Army: Defend the Dragon's Lair from Chaos this Friday! Forces of Chaos: Break into the Lair and get past the defenses put in place to protect the Mirror Realm'sgreatest treasure! 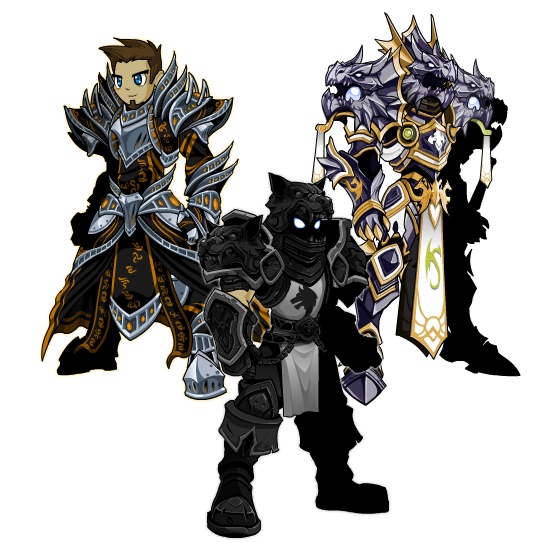 /Join Darkoviaattack or Darkoviadefend and start farming for those war medals, because there are two all-new sets in the shop! Legends can unlock the Stalagbite's Champion gear and ALL players can unlock the Stalagbite's Herald items! 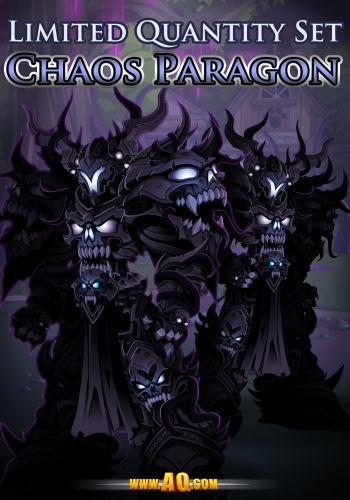 NEW: Stalagbite gear in the Chaos War Merge Shop! Artix and Miko put together an amazing event page for the Summer of Chaos! We will update this each week so you can follow the storyline's progress... just beware of spoilers - if you miss a week, you'll definitely want to get caught up! Legend-only Release this Friday: Recruit Xan! Xan the Pyromancer is one of Lore's most powerful - and most INSANE! - pyromancers... and he will be a powerful ally for the Alliance... IF you can recruit him! He is hiding somewhere in the Northern lands, plotting to take down the 13th Chaos Lord... we think! You can never really be sure with him. But this Friday, Legends will find out exactly WHAT his plans are AND might be able to help take out tens of thousands of Chaos Warriors! Get the best HeroMart gear on your mobile device! Hail, the all-new HeroMart.com! We welcome you to 2014! 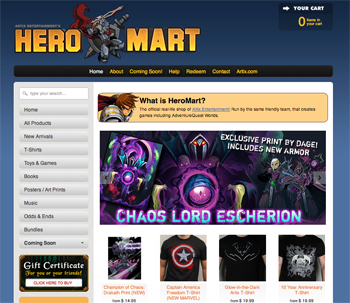 HeroMart.com has a hot new look and hotter new items. And the best part is: HeroMart.com is mobile friendly! 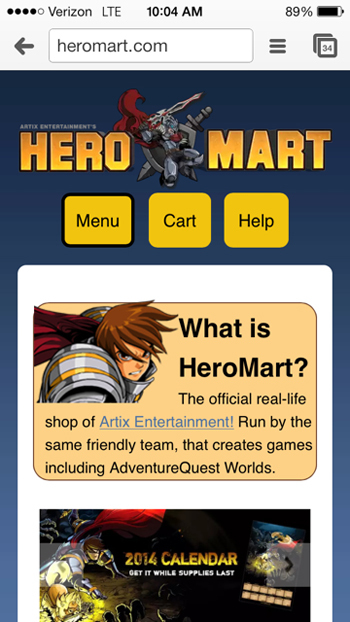 You can easily browse all HeroMart goodies, and make purchases right from your phone or tablet! 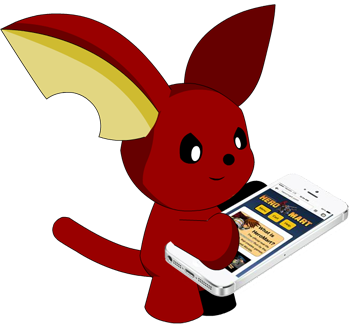 It’s so simple, even a Moglin could do it. Wait… I don’t think furry paws work on iPhone screens. Sorry, Twilly. Just open your favorite browser on your mobile device, check out www.HeroMart.com, and then checkout in the palm of your hand! All Forces Report to Darkovia! Unlocked: the Chaorrupted Lycan Hunter Boss fight! Invasion of Darkovia Battle Plans! The 13th Lord of Chaos is preparing for a MAJOR blow to the Alliance's morale! At stake is the life of Vampire Queen Safiria and her 10 million vampire minions! 13 runes flash atop the Chaos Portal. 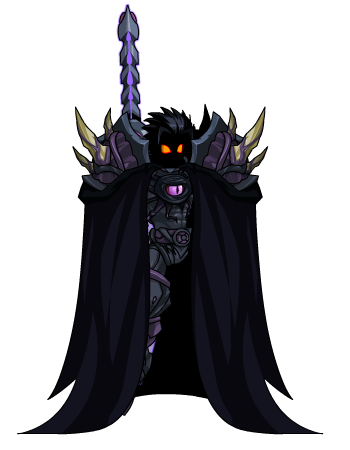 Drakath, Champion of Chaos, watches as Lore falls to the might of the 13th Lord of Chaos... and laughs! HA HA HA... IT IS ALMOST TIME, CHOSEN ONE... THE SUMMONS HAS GONE OUT... I WILL SEE YOU AGAIN ONCE YOU ARE DONE DESTROYING THE WORLD YOU FOUGHT SO HARD TO SAVE! 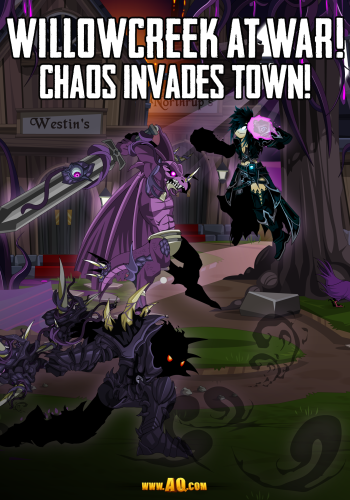 Invasion of Doomwood AND Darkovia! 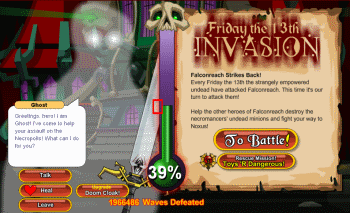 The forces of the 13th Lord of Chaos demolished Willowcreek earlier this week, and the attack against Doomwood is happening now! To strike fear in the hearts of Alliance warriors, the Legion of Chaos is ALSO marching on Darkovia this weekend. At stake: the Vampire Queen's life! Starting tonight, /join darkoviaattack OR /darkoviadefend to begin fighting in the NEW battleground! You can still /join forestattack or /forestdefend to conquer or save Lightguard Keep, but the World War Lore has just become MUCH deadlier! Will You Invade Darkovia... or Defend It? The Lycans and Vampires have an uneasy truce while battling Chaos, but if the army of Chaos succeeds in conquering Darkovia, the Queen of the Vampires and her 10 million minions will be destroyed… FOREVER! 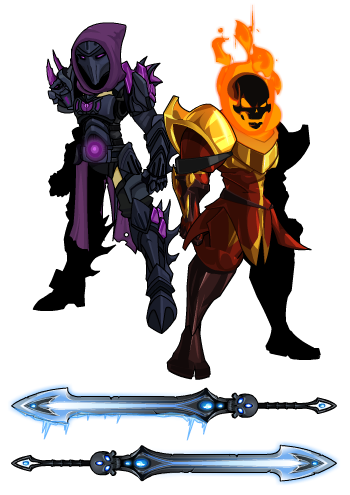 The forces of Chaos AND the Alliance's army will need to fight harder than ever, because the life of MILLIONS of vampires depends on who wins the war in Darkovia... and the safety of Lightguard Keep depends on who is victorious in Doomwood! In the world of Lore, one thing is always true: trust NO ONE... especially not Warlocks! For the final package in our Fantasy Hero trilogy, Tyronius took inspiration from the much-beloved (or reviled, if you're a follower of Good/the Mother of Dragons) warlocks of Quarth in the Game of Thrones series to create an all-new armor set! 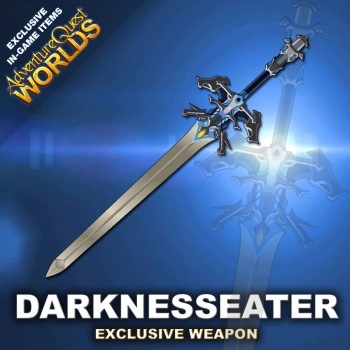 Buying a special package pass for $60 USD will unlock ALL of the gear from the Wolfhound Warrior, Dragon Champion, and Forsaken Warlock packages, PLUS an exclusive character page badge AND 1500 AdventureCoins! * Once those packages go live, anyone who bought the pass will automatically get them in their badge shop in the book of Lore. * Once Captain Rhubarb returns from vacation! Our Newest Tiered Package is live! 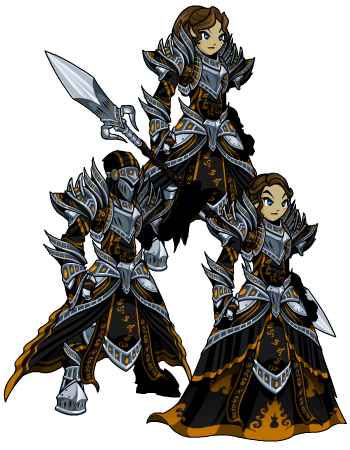 Next Friday, June 20th, the Dragon Emperor Tier Package AND the Shadowfall Commander Upgrade Package sets are leaving for good! 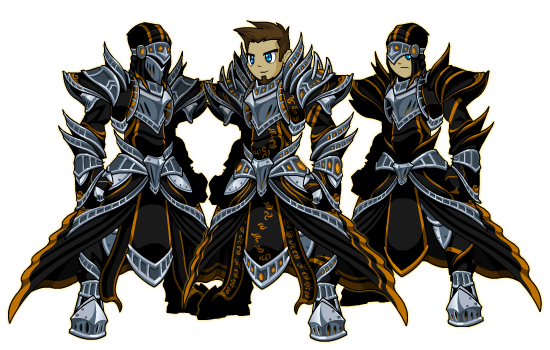 We will be adding in the Dark Warlock set at 12:01 AM Friday morning! As with the rest of the Fantasy Hero tier packages, all of the items above will be added into the Fantasy Hero shop that comes with the Fantasy Hero Package Pass! *Female armor transforms when you click the skirt! It's the Summer of Chaos... and THAT means we're doing something AWESOME! 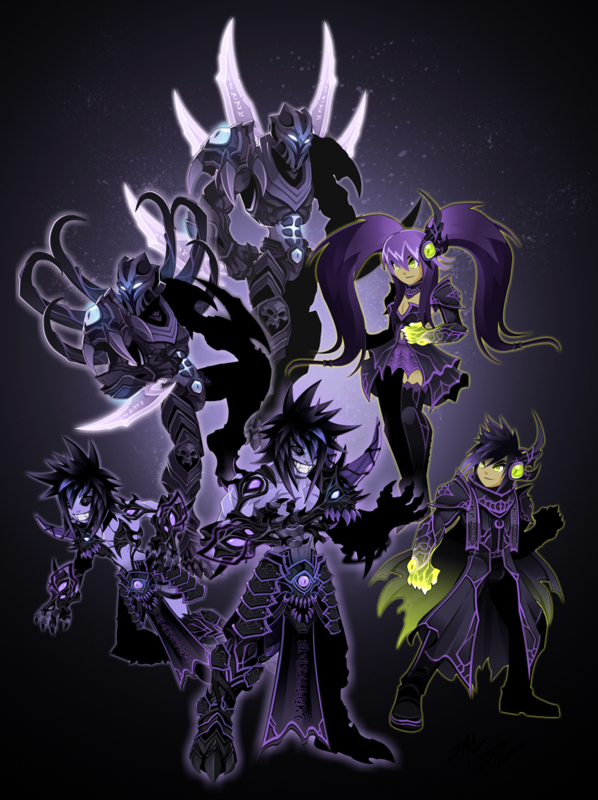 If you've bought ANY membership package in the month of June, you will unlock the Shadow Warlock set! Why are we doing this? Because you guys are amazing, and we are so grateful that you are battling alongside us! We want everyone to enjoy this summer's event as much as possible, and this is a great way to do that! Lightguard Keep Raises Its Defenses! The Attack on Willowcreek has ENDED with victory for the forces of Chaos! Congratulations to the 13th Lord of Chaos and the entire Chaorrupted Legion! You have done well... but the Alliance is preparing to hit you HARD and FAST ... and the next encounter begins NOW! /Join WorldWarLore and speak with Loremaster Maya to battle the forces of Chaos attacking Doomwood OR embrace the Chaorruption and invade! If Lightguard Keep falls, the Alliance will be sorely weakened! The 13th Lord of Chaos Is Plotting! Military strategists know that no battle plan survives the first encounter with the enemy... and THAT is why the 13th Lord of Chaos is preparing a surprise for ALL of you! The clock is ticking, Heroes, and if the Alliance doesn't hurry, they may find themselves fighting a war on TWO fronts! Loremaster Maya has heard rumors that Chaos creatures around the world know the 13th Lord of Chaos' next attack location... slay them to discover what the plot is! 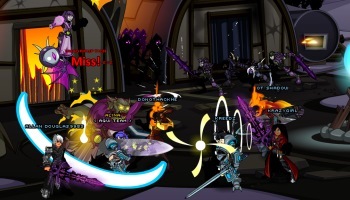 Show Us Where Else Drakath Strikes! 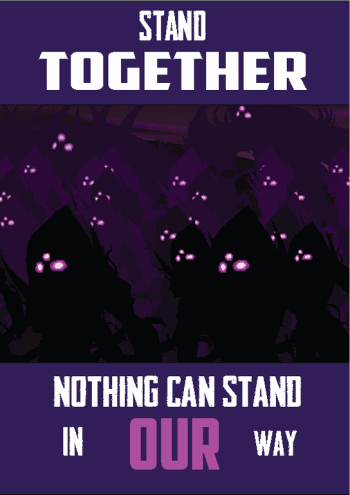 We have received SO MANY incredible posters and art over the last several weeks, as you guys are try to recruit help for your side in the war... so let's keep the fan-art flowing! 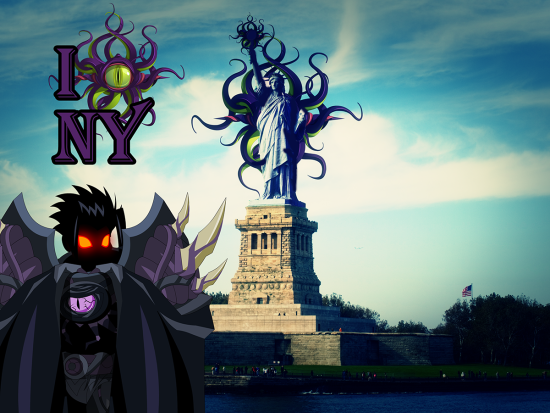 Artix created the picture above, where Drakath has taken over the Statue of Liberty in New York City... Chaorrupting the Big Apple to the core! 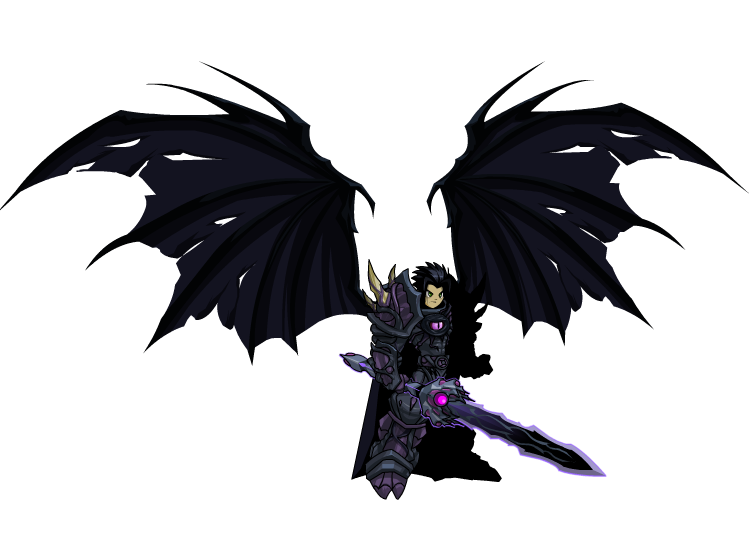 While we wait for the next battle in World War Lore to begin, show us where YOU think Drakath would strike! 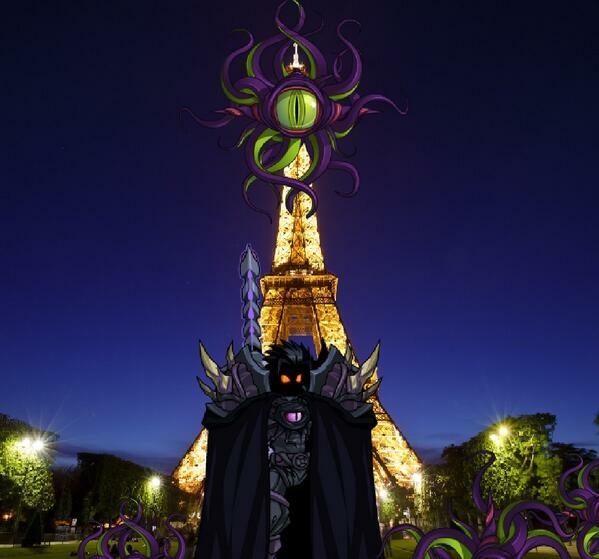 Tweet your best shot of Drakath taking over your town (or your favorite famous landmarks!) to me or Beleen and we'll post them on our Facebook and the Design Notes! Check out all the places AQW Heroes have seen Drakath so far at our Drakath Sightings Guide page: Drakath Invades Earth! 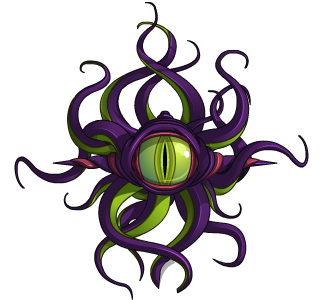 Click on the following links to get transparent background PNGs of Drakath and the Chaos Eye, then rght-click on the images and save to edit them into your pictures! 13th Chaos Lord Prepares Next Invasion! The forces of Chaos have taken Willowcreek, and it will NEVER be the same again! 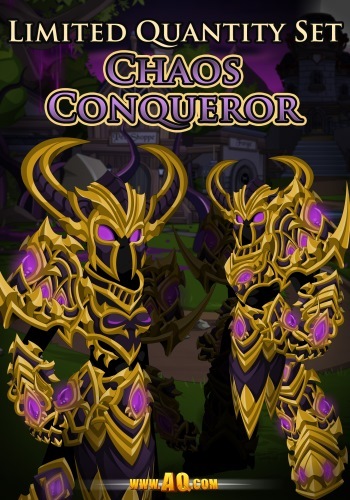 As the Alliance battles to save what remains of Willowcreek, the 13th Lord of Chaos' army has been seen preparing to march on Doomwood! The battle for Lightguard Keep begins TOMORROW! 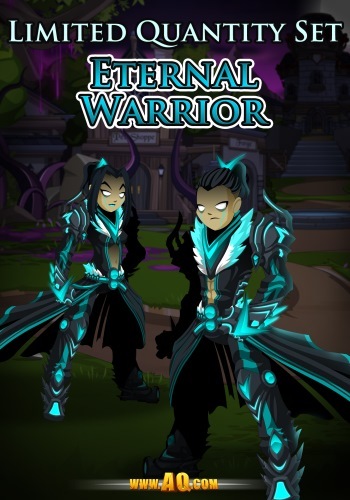 If you are still battling in the /creekattack and /creekdefend zones tomorrow, you will want to shift your attention to the Doomwood area to continue battling in the war! If you have a Willowcreek Treasure Chest key, you will be able to access the shop from Loremaster Maya tomorrow, so keep on battling, warriors for Chaos! The Alliance has fought SO hard, that the townspeople of Willowcreek will be able to restore much of the town, but sometimes it is good to have a reminder of what you've faced... and what you're fighting for. Join us tomorrow as the NEXT battle in World War Lore begins! Ninja Drew Drechsel gets #1 time! 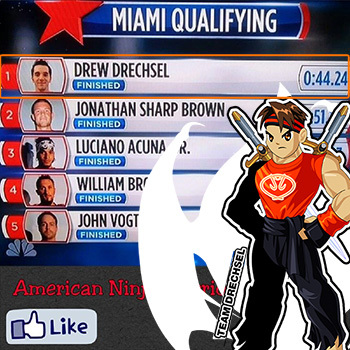 On last night's TV episode of American Ninja Warrior on NBC, our favorite "Real Life Ninja," Drew Drechsel, completed the course with the #1 fastest time! 44.24 seconds. WAY TO GO DREW! You can send him a congratulations on his twitter... @NINJADREW!!! I was deeply honored that for his TV interview, Drew wore the "Real Life Ninja" shirt that I designed for him. In addition to Drew, several of our other friends including Reko Rivera (The guy who breathed the fireball) and Ryan Stratis successfully completed the course! It was a really exciting and good night of runs. I hope you join us in cheering them on in the Miami Southeast Region Finals. SPOILER: This episode choose to focus on the long time rivalry between Drew and another famous contestant named "Flip". They showed Drew's run first and he took 1st place. The pressure was on for Flip to beat it. Unfortunately, Flip's foot slipped on the cargo net during his run causing Flip to touch the water and be disqualified. A good reminder that no matter that no matter how talented someone is, the course is TOUGH and just one tiny miscalculation can end it... and Flip is REALLY REALLY good. Give the Gift of Gaming with Artix Points! Giving the gift of Artix Points is something everyone will enjoy... AND it's the 1 gift that can be used in 7 games! There are two different types of gift certificates you can give! This gift certificate arrives in your postal mail, and comes with an in-game item. Buy a physical gift certificate here. This gift certificate arrives in your email, and does NOT come with an in-game item. Buy a virtual gift certificate here. Enter your information and code to redeem it for Artix Points! You will also get a unique code for the in-game item when you purchase a physical gift certificate. You can redeem that code on the same page as the link above. *Redeeming a virtual gift certificate from the Portal site uses the same steps to redeem the code, but you will receive your unique code via email. Artix Pointers: What Are Artix Points? Artix Points are the universal currency for your 7 favorite Artix Entertainment games. You can use them to get memberships, upgrades, and elite game currencies in all our games! Memet posting for Mysterious Class Designer! Guess who’s back again? The Mysterious Class Designer is here to give you the purple-y and juicy details of Chaos Slayer with this new skills breakdown. As you may already know, Chaos Slayer is separated into 4 classes that have the exact same abilities: Berserker, Thief, Mystic, and Cleric. Chaos Slayer is really a class above classes - or as I like to call it, a class to end classes. Chaos Slayer embodies the nature and power of Chaos in that you can’t predict what it will do next. However, one thing is certain; this class holds great power. Chaos Slayer is a Physical/Magical hybrid with a Mage’s mana regeneration model. This means that you get mana back based on how much damage you dish out relative to your own HP, especially on crits. Regaining mana won’t be too much trouble, and you’ll see why. The best stats to focus on are Intellect, Strength, and Luck. For this crazy and chaotic class, you have to focus on both your LUK stat and your luck in real life. The Chaos Slayer's weapon attacks are empowered by Chaos making any weapon strike hit like a blade made of pure chaos. Every strike draws in more Chaos blight. Hits up to 3 targets. If you are Chaorrupted, this becomes a single-target ability. This autoattack is unique because it hits up to 3 nearby targets. For each successful hit, you gain a stack of Chaos Blight, which increases your damage slightly. This will increase the base power of all your other skills, too. The more targets you hit, the more mana you regain. Let the Chaorruption take over and render your physical form. Deals moderate damage and Chaorrupts the Chaos Slayer, increasing crit and hit chance by 10% and focusing all attacks on a single target. This ability turns you Chaorrupted and is best used for fighting a single enemy because all of your attacks – including your autoattack – will be aimed at one target only, like when you’re fighting a boss monster. The hit chance and critical strike chance buff are there to help you with mana control. It will ensure that you hit your target more often because you’ll lose your stacks of Chaos Blight if you miss consecutively. The critical strike chance buff will increase your chances to crit and gain more mana back. Chaos is the unpredictable power shrouded in mystery. What effects will be inflicted onto your targets? Deals no damage and randomly applies up to 4 effects. Hits up to 6 targets, but will become a single-target ability if you are Chaorrupted. Delusion - blinds your targets and lowers their hit chance for 10 seconds. Impasse - traps your targets and greatly reduces their chance to dodge. Courageous - buff your targets’ defenses, making them take 50% less damage. Yes, that's right – it buffs your enemy. Luckily, this effect has a much lower chance to activate than the others. When you are Chaorrupted, Enigma becomes a single-target ability. Summon Chaotic forces to mend your wounds or protect your physical form. Either heals you for a moderate amount over 6 seconds or places a defensive buff significantly reducing all incoming damage for 8 seconds. This skill will either give you a heal-over time or reduce all damage you take by more than half. The heal-over-time gets stronger with each stack of Chaos Blight you currently have. Enmity – endurance increased by 25%. Ultimate Power – Chaos, the power within, consumes you. Who doesn't want more HP? Enmity gives you more survivability, which makes Chaos Slayer even tougher to beat. As for Ultimate Power, chaos has not yet shown us the true effect of this skill. The outcome of the Doomwood war will affect the rank 4 passive's Ultimate Power skill – if the Alliance wins, it will become a 15% crit damage buff. If chaos wins, it will become a 10% attack buff. The fate of this class is in your hands! Create even more Chaos with a massive explosion, hitting up to 6 targets and evolving all effects from Enigma into more powerful effects. If you are Chaorrupted, this becomes a single-target ability. In addition to its high damage burst, Pandemonium also amplifies all of the effects from Enigma. If your targets have Delusion, it will apply Ataxia which will sharply cut their chances to critically strike for seconds. If your targets have Impasse, it will apply Numbing which will significantly drop their haste for 10 seconds. If your targets are Courageous, it will apply Paragon which will increase their outgoing damage by 500%. Needless to say, if your target already has the Courageous buff, you may want to avoid activating this skill. Spell Disruption – All spell damage taken is reduced by 35%. 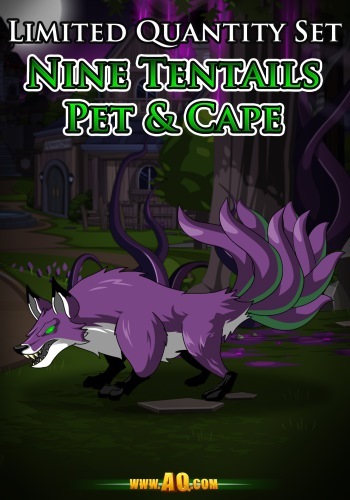 You won’t find many monsters in AQW that deal spell damage to you, but this can be useful in PvP. If you combine Spell Disruption with Surge, you’ll take very little damage from spell attacks. There you have it, a breakdown of all the effects of Chaos Slayer. This class is fun to use and wild in battle. Chaos Blade is the best autoattack I have seen since it gets stronger as the battle progresses. I really enjoy having the option to switch between AoE and single-target mode with Chaorruption. You really have to watch out what Enigma will apply – since it has a short cooldown and uses little mana, you can keep spamming that skill until you get the effect you want. Then you can finish it off with Pandemonium. Always watch your HP because Surge might not give you the effect you want. With its several buffs and debuffs, Chaos Slayer is awesome for farming, soloing, PvP, group battles, and support – you could even say it's the ultimate class. Willowcreek Conquered by the Forces of Chaos! The 13th Lord of Chaos and their minions have conquered Willowshire... our first loss ever against a Chaos Lord. After inflicting horror and unbelievable casualties... and leaving behind a "Chaotic Beast" to keep the townsfolk in terror... the main forces of Chaos have moved on to attack their next location. We do not yet know where... but we suspect the attack to commence tomorrow or Wednesday. Artix von Krieger says ,"Alliance forces... a single battle does not determine the outcome of a war. 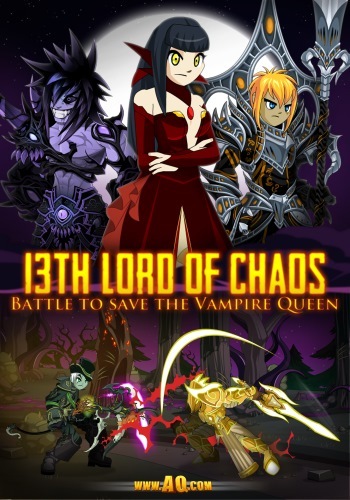 We can still stop the 13th Lord of Chaos before their armies reach the town of Battleon. We WILL NOT allow them to conquer another of our towns! BATTLE ON!" To all the Father-Heroes out there... Thanks! Father's Day is the time of year when we dust off our golf bags, sharpen our grilling spatulas and let our dads, grandfathers and other father figures know how much they mean to us! Every father will enjoy the bounty of BBQ grill gear, the up-to-par Golf Suit set, a Gravity Defying Coffee Mug, the paper-cut-inducing Newsparchement, and the good Ol Fishin’ Armor Set... you can find them all in your Game Menu. Or better yet, get your dad to log in and battle alongside you! Then he can get his own! Chaos Forces Advancing as Willowcreek Burns! World War Lore is raging in Willowcreek as the war meter is about to hit 75%! Except the Alliance of Good and Evil! The forces of Chaos won the 50% war challenge and unlocked the Willowcreek Treasure Chest. (Battle the defenders in /creekattack to get the key.) The defenders of Willowcreek have also become weak to Chaos damage! The Most Chaotic Friday the 13th! If you missed it last week, the Friday the 13th Limited Time Shop is live! (We did not do an event with long-time guest star Voltaire as we are right in the middle of WORLD WAR LORE... the craziest, most massive war to save Lore we've EVER done! We DO have an idea for an event with Voltaire later this year, but we should talk to HIM first before we give you any details! Friday the 13th + Ghost Birthday = WAR! Wish him a happy birthday on Twitter, then get all his birthday gear in the Friday the 13th Shop when you /join worldwarlore! The Legion of Chaos Attacks Willowcreek! 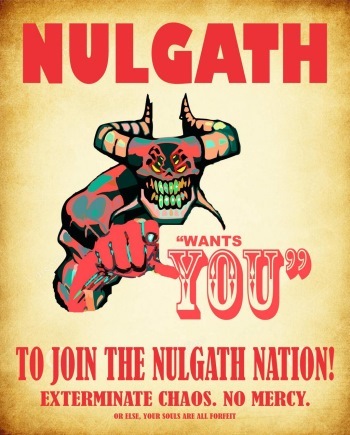 It is the eve of a war that will engulf the world… as the 13th Chaos Lord prepares their forces to do what no Chaos Lord before them could… This week, /join WorldWarLore at the foot of Mount DoomSkull for the beginning of a war that will wreck everything... and no one knows what happens (not even US!) until you take action! A reign of Chaos so powerful, the land will NEVER be the same! Unsheathe your blade and prepare to charge as Chaos creatures begin their attack on Willowcreek! Choose to battle Chaos when you /join creekdefend OR... fight on the side of Chaos when you /join creekattack! Attackers will battle the heroes of Lore! * The Chaorruption in Willowcreek is causing the villagers there to appear to be entirely different people! Forces of Chaos: you do not know WHO you'll be fighting... you just need to want to WIN! Who will fight FOR CHAOS?! As the war meters rise, the town itself will change... so if you do not want to see the homes and fields destroyed... get in there and Battle On! And if you DO... get in there and Battle On! * Out-of-character explanation: the player-monster names in /creekattack are ALL taken from other real players. Any player on your server when you join it has a chance for their name to appear to YOU as a monster. Willowcreek 50% Chaos War Challenge! EVERYONE loves a challange, and we've got a reeeeeeeeally good one for you to start this war off right! Alliance: If you hit 50% before the Chaos faction, the damage done to Willowcreek will begin to reverse! Willowcreek Treasure Chest: The FIRST side to hit 50% will ALSO unlock the Willowcreek Treasure Chest, which has several exclusive items locked inside! Once the chest is unlocked, farm the monsters in your map for the Willowcreek key! Battle alongside your fellow heroes to defeat your enemies to save the world... or destroy it! For many of you, this will be the FIRST war you've ever fought in, and you're in LUCK! This is the BIGGEST, CRAZIEST, most CHAOTIC war AQWorlds has ever seen! But if you're not sure how to fight in an AQWorlds war, then read on! Choose a side: You can choose to battle FOR Chaos or defend the town against it. War Meter: Defeat your opponents to earn war tokens, then turn them in to increase the war meter. When the meter hits 100%, it unlocks the war boss. War Tokens: There are two different kinds of tokens. Turning in 30 regular tokens to increases the meter by a regular amount. Turn in mega tokens to increase the meter by DOUBLE the normal amount. Goals: Raising the war meter unlocks special achievements - special shops, challenge fights, cutscenes, or the war boss (once the meter hits 100%). Defeat the war boss unlocks a cutscene, then advance to the next stage of the war. You and the rest of the heroes in Lore will all be fighting together to reach a common goal: victory! With every additional hero who battles in the war, you'll reach the 100% mark that much faster... and that means you'll unlock the rewards and storyline ending sooner, too! Everyone LOVES free stuff. And when you use a Credit Card or Paypal to buy Artix Points, you get 10% more Points FOR FREE! Artix Points are the most powerful points in the universe, forged from crystallized dragon’s breath, marbles, and, of course, a little duct tape. Artix Points are the universal currency for your 7 favorite Artix Entertainment games. 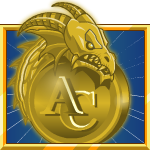 You can use these Points to get memberships, upgrades, and elite game currencies: AdventureCoins in AdventureQuest Worlds, Varium in EpicDuel, SmashCoins in HeroSmash, and Soul Gems in OverSoul! Bonus Mode: +100 AdventureCoins each month! Ohh AdventureCoins, how we love you so. 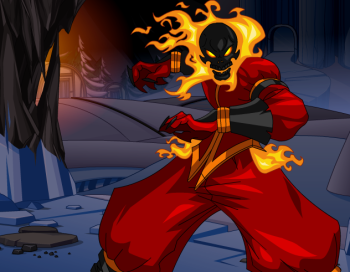 And if you want the coolest items in AQWorlds, you’re ganna need ACs. Well, you’re in luck, because you get 100 bonus ACs per month of your Membership upgrade! SWEET! Better cast an agility buff, because these deals are only good through the month of June! 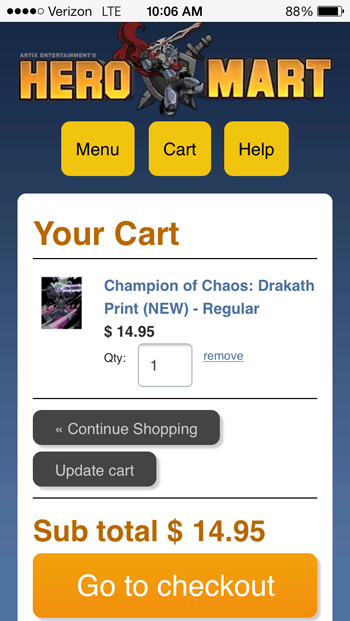 Order your Artix Points here! Starting last weekend, Alliance scouts reported that chaos monsters from across the land suddenly left their positions and headed towards mount Doomskull. We believe that the 13th Lord of Chaos, whomever that may be, will lead their forces to attack us on Friday... but we do not know where. We sent our most talented scouts & rangers to steal the Chaos Attack Plans. But thus far, none have returned. We need to know where the attack will take place... alliance forces are too spread out, and too few following the battles against the first 12 Chaos Lords.